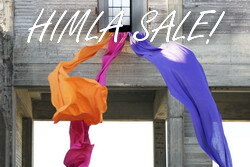 Selected table linen made by HIMLA reduced about 30%. We need more space and clear out some articles from the current HIMLA collection. Think about the upcoming holidays and celebrations, Mother's Day, Communions and Confirmations and take the opportunity to equip yourself with beautiful table linen at considerably reduced prices. Choose from linen and half-linen napkins, place mats, table runners and tablecloths in many beautiful colours.